June 11, 2010 by D.T. Not too long ago a hybrid gas electric vehicle was viewed as some sort of science experiment. 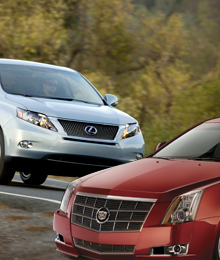 Fast-forward a decade and hybrid vehicles are now all the rage and moving into the premium segment. Lexus was one of the pioneers in offering a hybrid in its line-up of luxury vehicles so it was only natural for Lexus to offer a hybrid version of its popular RX350 SUV in the form of the RX450h hybrid. TOP LEFT: The futuristic ladies of Northwest Toronto strike a pose next to an outstanding vehicle of what’s to come. 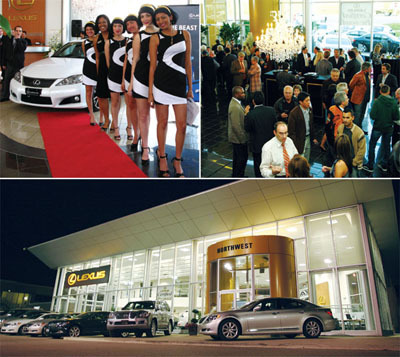 TOP RIGHT: Guests and the employees of Northwest Lexus mingle about the posh dealership, ready to network amongst their car-friendly peers. ABOVE: The all-glass showroom of NorthWest Lexus, located at 2280 Queen St. E. in Brampton, Ont.